I’ve been spending much of the week preparing for a couple of early literacy presentations I’m giving to parents at two different area libraries. One of the libraries specifically requested early literacy activities their parents could do over the summer that would keep their kids reading and developing early literacy skills, so I have been putting together a list of crafts, games, songs, and other ideas that they can use at home. One of the great websites I’m suggesting is KizClub. It’s got great printable activities related to phonics and alphabet learning, as well as specific story-related activities. From there I printed out the 5 Little Monkeys Jumping on the Bed set. 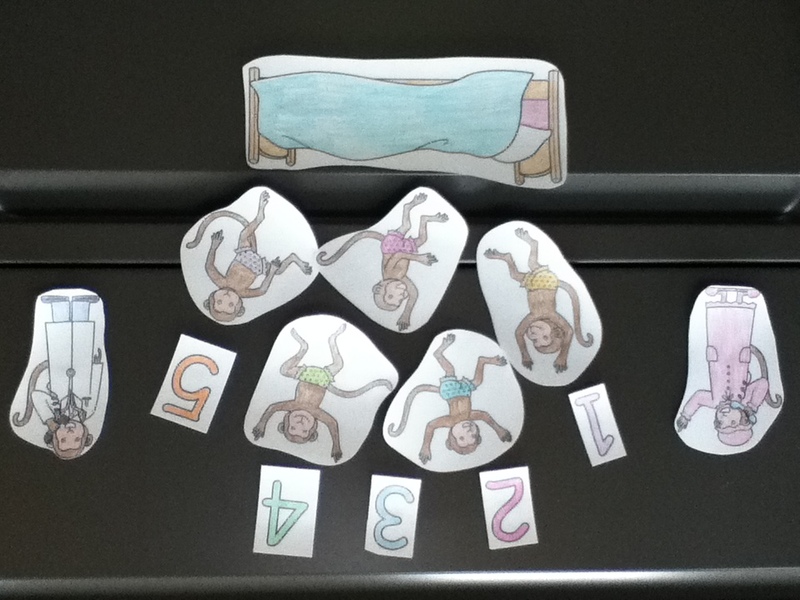 I colored it, had it laminated (you could also use contact paper), cut out the monkeys, bed and numbers, and stuck a magnet strip to the back of each (luckily my friend was getting rid of TWO HUGE ROLLS of magnet strips). Voila! Substitute a cookie sheet for the flannelboard, and I’ve got a story to tell! Most parents don’t have flannelboards at home, but they often do have cookie sheets. If no magnet strips are handy, or contact paper, this activity can be just as much fun simply by coloring and cutting out the pieces. Parent and child can still use them to tell the story! Haven't those monkeys learned their lesson? Easy peasy, mac ‘n cheesy! Check in later at 1234 More Storytimes for the Flannel Friday Roundup! Cookie sheets and magnets are a great way to encourage flannelboard use while at home! That’s a great idea!